The U.S. Fish and Wildlife Service lists the gray wolf species as endangered. The Mexican gray wolf sub-species population in Arizona, New Mexico, and Texas is considered “experimental” and is not included by the U.S. Fish and Wildlife Service when assessing the species. The Wyoming, northern Rocky Mountains, and western Great Lakes “distinct population segments” have been de-listed due to recovery meaning these particular populations are not protected by the “endangered” status of the species. International Union for the Conservation of Nature Status: Least Concern; population stable. A large, dog-like animal weighing between 50 and 175 pounds. Wolves at lower latitudes are generally smaller than northern wolves. The muzzle and face of a wolf is narrower and less-full than that of a dog. The chest is narrow and legs are long. Movement is graceful and well-adapted to pursuing prey. The ears are pointed and its tail is long and bushy. Gray wolves range 3.5 – 5.5 feet in length, with tails adding 1-2 feet. They can be up to 3 feet tall at the shoulders. 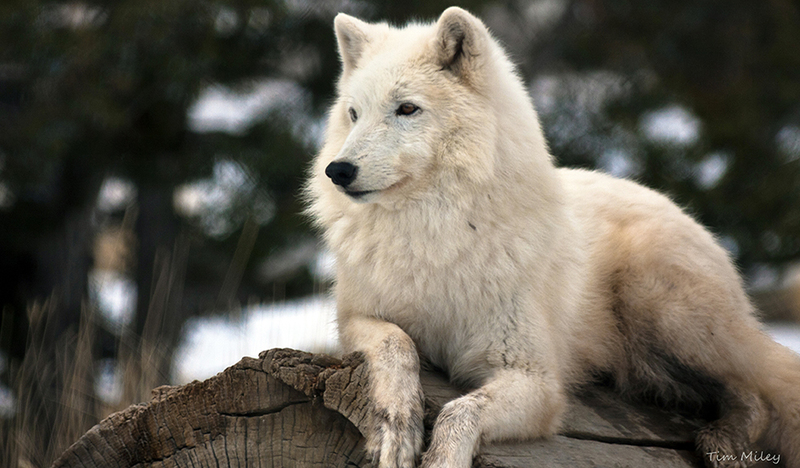 Wolves come in a variety of colors ranging from pure white to purely melanistic (black). Shades of grays, browns, and reds are common, often accompanied by a white underside and legs. There is a scent gland at the dorsal base of the tail. In North America, mostly in Canada and Alaska. Until they were extirpated from much of the U.S., wolves were distributed throughout the entire Northern Hemisphere from the treeless tundra of Alaska and Canada to the forests of the Rocky Mountains and to the deserts of the Southwestern U. S. Some may remain in Mexico. Wolves are also in parts of eastern Europe and throughout the majority of western Europe, Asia, and Middle East. A wolf can eat 1/5 of its body weight in one meal and will kill large animals, such as caribou, musk ox, deer, moose and elk when hunting with the pack. Wolves may also kill sheep, horses and cows when natural prey is scarce, which is why they were driven to the brink of extinction in the United States. European settlers arrived with negative feelings about wolves which also contributed to this decline. Gray Wolves are monogamous, often mating for life. In the pack, only the alpha pair has sexual rights during breeding season. Females are normally sexually mature at 2-years of age. Males are sexually mature at 2- to 3-years of age. Cubs are born in a den prepared by the mother, usually underground or in a cave. After a 63-day gestation, the mother gives birth to 5-8 pups. Cubs are born blind, usually April to May. Their eyes open 11-15 days after birth. 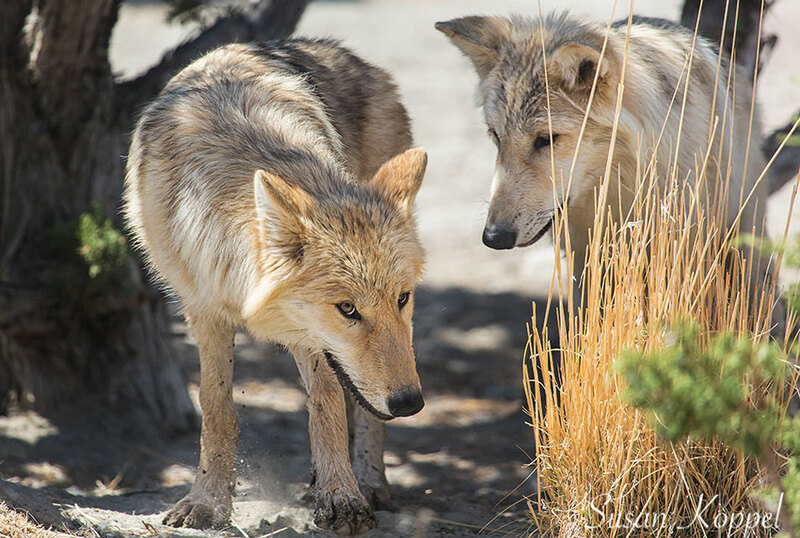 Other pack members aid in the care of the young once they emerge from the den. Cubs are fully grown by 12 months, remain with the parents for a year or more, and often become full pack members. Some wolves may disperse. Wolves are social animals, living and hunting in packs. Their territories vary according to habitat, prey, and pack dynamics. Wolves yip, howl, growl, and whine to communicate with other pack members or as a warning to other wolves nearby. They are famous for the long, mournful howl heard at night, which is a means of long-distance communication. 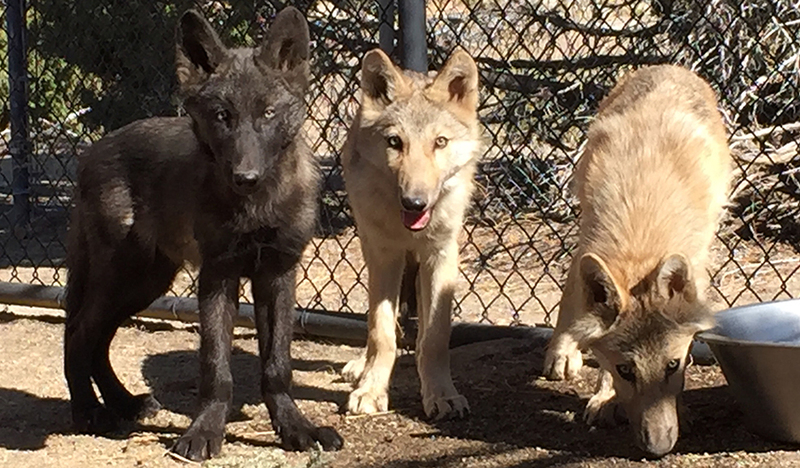 Adult wolves whine to pups to call them out of the den. Wolf packs do not hunt humans. There are few reports of possible attacks on humans, but these are rare and extreme circumstances. Wolves are apex predators, helping to stabilize prey populations and ecosystems. For example, following wolf extirpation from the Yellowstone area, elk and deer populations increased past the capacity of the available food resources. Even though these prey species began consuming the lower leaves and branches of trees, many died of starvation. The trees began to die as well from this consumption, further affecting the entire ecosystem. When wolves were reintroduced to the region, elk and deer populations re-stabilized, trees began to recover, and the ecosystem balanced. A single pack’s home territory could encompass 1,000 square miles. Wolves may follow a given herd of prey for miles, investigating the herd for possible targets. Wolves can sprint over 30 miles per hour. While most packs average 10 members, one pack had 36 reliable members. Wolves howl dissonantly with each other. This behavior makes it difficult or impossible for a listener to identify the number of wolves howling.